In some ways we are a very modern family. We speak in English—and we speak our minds. We go online. We take advantage of technology — all of us have cell phones, though they don’t work in the house. But in one important area, we are a real old-fashioned Japanese family. In winter, we gather in the living room and spend our free time sitting around the kotatasu. 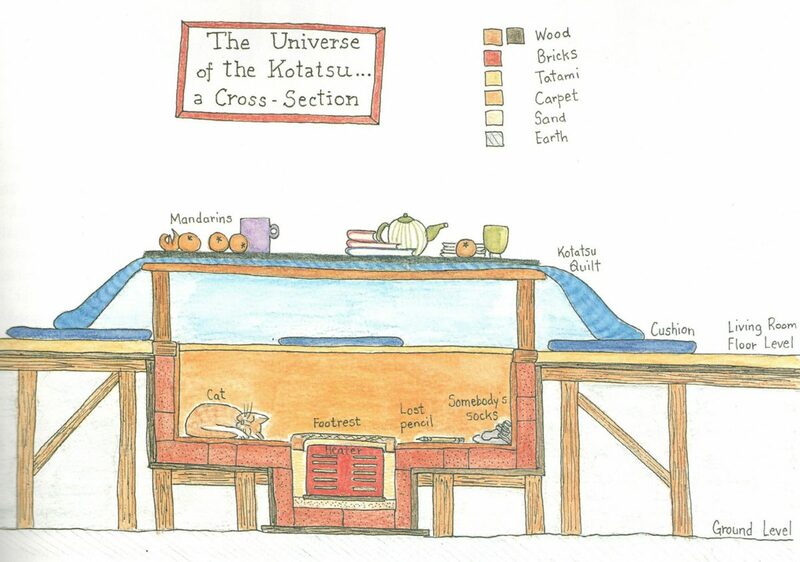 A kotatsu is a low table with a blanket or quilt spread over it and a heating device inside. In old houses like ours, the area under the table is often actually sunk into the floor, so the legs can stretch out and the feet can rest directly on the little heater. 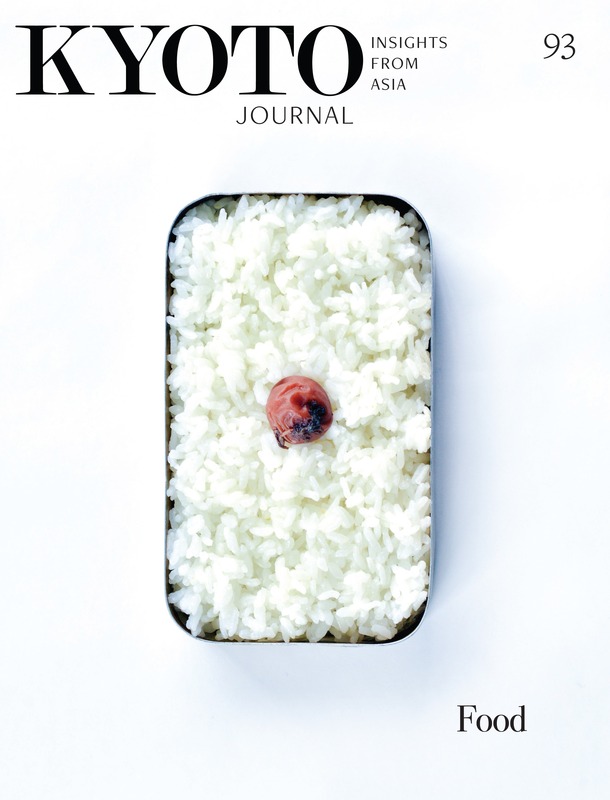 Although not as universal as it used to be, what with the advent of heated floors and carpets, it still occupies a prominent place in the Japanese heart. Efforts have been made to modernize the kotatsu. Of course, the heat source is now electric, replacing the traditional bed of coals which sometimes resulted in fire or asphyxiation. The pattern on the quilt changed too. The decorative title of this essay features a typical unapologetically loud and cheerful design of a quarter-century ago, whereas the quilt in the illustration shows a more modern sensibility. Rectangular kotatasu, circular kotatsu, even kotatsu the height of a dining table with the chairs—all have made their appearance. But perhaps the essence doesn’t change: the casual, comfy, knee-rubbing, foot-bumping, snack-eating, cat-dozing, intimate coziness of it. The kotatsu is for the family, not for guests, It’s hard not to feel like a member of the family when invited into the kotatsu room, surrounded by drying laundry, the odd stack of newspapers or mail, mandarins, teacups, the whiff of kerosene stoves and whatever was for lunch. So many memories are grounded in this humble piece of furniture. As children they hide in it with just their heads poking out to watch TV. As students, they do their homework at it or snooze with the familiar quilt pulled up to their chin. As Dads, they retreat behind the newspaper with a hand reaching out now and then for another mandarin. As Moms, they do their nails or write a postcard, savoring the relaxation after the usual hectic evening of Doing for the Family. As old grannies, they knit. As grandpas they just sit and warm their bones. Winters are so cold, and the house is so old and drafty, that we naturally gravitate to the warmest room in the house, conveniently situated with phone, TV and kitchen close at hand. Weekends in particular will find us all around the kotatsu, companionably engaged in our own projects, with regular mealtime hiatuses when everything is cleared off the table (yes, we even eat at the kotatsu). Photo albums, handwork, Scrabble, comic books, vegetable cutting, mild squabbles over TV programs or videos, math problems, phone conversations — this is a multi-purpose space indeed. When the snow is deep, except for bath or bed, what better place could there be? One of my dreams is to have an efficient heating system in our house, so that the rooms are comfortably warm instead of a couple of degrees above chilly, and the yearly struggle with kerosene stoves might evening be just an unpleasant memory. But if I should every be rich enough to afford an interior makeover, I would probably want somehow to maintain a lifestyle that still includes our good old kotatsu, the embodiment of home, family and Japanese-style comfort. Since the passing of her mother-in-law, Rebecca Otowa has assumed responsibility for her 300-year-old and land in Shiga Prefecture. In the summer of 2003, she began writing a book of essays arranged as a year’s diary of her life and experiences.